By week TWO you will be communicating with animals! You graduate in just 6 weeks! 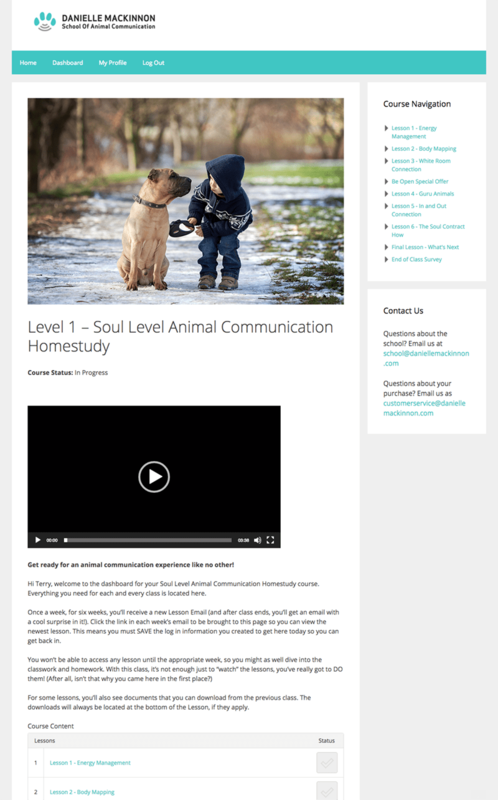 What is Soul Level Animal Communication® Anyway? Did you know that you have the ability to connect with animals on a level that is beyond the physicality of playing catch with your dog or snuggling with your cat? Animals are here to serve as teachers, messengers, leaders, and spiritual gurus. They are in YOUR life because they have chosen you on a soul-level to teach you how to be a better human and help evolve your soul to a level of pure love and Soul Level Animal Communication® shows you how to tap right into this! This is what being an animal psychic is all about! That’s where I come in!! This 6-week course is a unique opportunity as I’m using my more than fifteen years of experience as an animal psychic to give YOU the tools and know-how to tap into a Divine aspect of your Self to access and develop your ability to intuitively connect with animals. The Danielle MacKinnon School is the only animal communication school that explores animal soul contracts and works at the soul-level while also developing your intuitive skills. I’ll teach you everything you need to know to expand, grow, and take off running on this new adventure with animals and intuition! This is the foundation to ALL animal communication work. It is what allows my students to be successful, confident and intelligent throughout the entire course and into their own animal communication! I like to say that this week’s lesson is my little secret “power pill” that is unique to my coursework! You’ll walk away from the first class with two NEW techniques you can begin using immediately to manage your energy. I help you understand how animals communicate intuitively using their bodies. 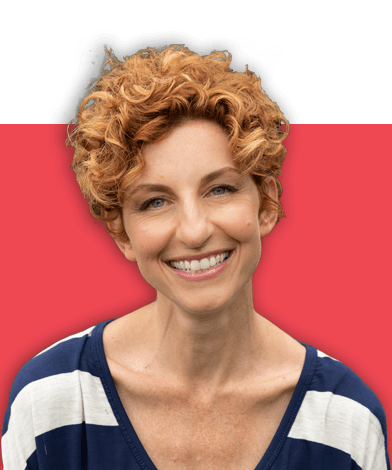 You’ll learn how and why animals often choose to work through their physical bodies, how to open your OWN body to intuitively receive the messages from the animals, and how to begin connecting with an animal – yup, week TWO! During this lesson, you’ll connect intuitively for the first time with your animal….how exciting! What messages will the animals have to give? Find out as I teach you my specialized technique for intuitive animal connection. You’ll learn the four most popular methods animals use to get their intuition information through to you, another powerful tool for energy management, how my famous “White Room” works and how to put it to use right away! During this lesson, you’ll again intuitively connect with your animal, but you’ll do this using one of the new techniques you learned in Lesson One. This technique will help you figure out what your connection space in your head actually LOOKS like, so you can get back there when you need to. My work has taught me that animals are without a doubt our gurus! This week I will teach you how to work with them in that capacity by showing you how animals are constantly working to help people better themselves, how to take your communications to the deepest possible level by allowing the animal to become a guru, and the best way to give and receive an animal reading. You’ll be able to use what you learn in this lesson to deepen the relationship with the animals in your life – in other words, you’ll find out what the guru connection is with your own pets. Now is the time to start pushing the limits on what you can do! Learning to master the “in-and-out connection” is important to experiencing a successful soul-level animal communication reading. 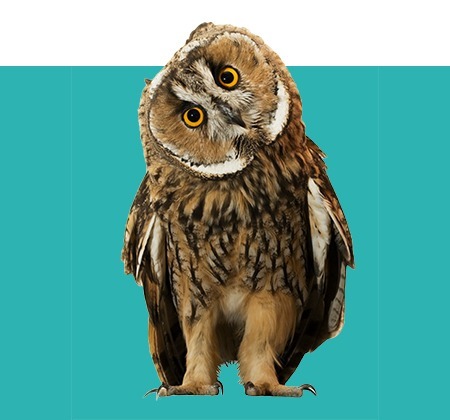 In week five, you will learn what it looks like to hold the connection too tightly (and how this can hinder your readings), how to manage distractions, and the most respectful type of reading and connection for the animal. PLUS during the class, I will take you through a reading so that you can try out the in-and-out connection yourself!! Every animal is teaching their human a beautiful soul lesson. Now is the time to pull together everything you’ve learned thus far so that you can go truly deep – to the heart of the matter with each animal with whom you connect! Here is where we’ll take your animal communication skills to the next level – I’ll help you understand exactly WHAT your pet is teaching you. You’ll be able to use what you learn here to figure out what soul lessons your pets are helping you master! And specialized just for you, all of your classes, homework, recordings, and everything else will be accessible to you through your own personal dashboard. Click here to get a glimpse of the dashboard now! At the end of the course, you’ll have learned everything you need to know to begin connecting with animals everywhere. Basically, you’re becoming an animal communication superstar! 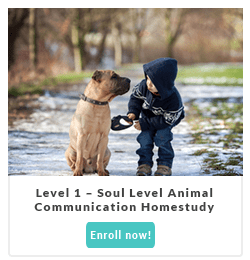 Begin Your Animal Communication Journey Today! 5-Day Money-Back Guarantee From the Day the First Video Course is Received for All Night School and Home Study Courses. Are you ready to take the next step and begin a 6-week journey that will forever transform your life? Are you ready to have deeper, more meaningful conversations and open a channel of communication with ALL the animals in your life? The Danielle MacKinnon School offers a money-back guarantee within 5 days of the first lesson if you are not inclined to continue. Just email us to let me know!